Each year, many people die and more are hospitalized as a result of the flu. 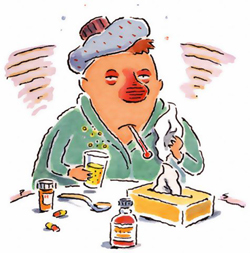 Preventing the cold and flu viruses is important during this time of year. Follow some simple tips to keep you and your loved ones healthy. Consider getting vaccinated each flu season. The Center for Disease Control recommends early vaccination each season, especially for people in a high risk category. Those considered high risk are: children under the age of 5, adults over 65 years old, pregnant woman, those with heart, kidney or liver disease, a person with a compromised immune system, or someone who is morbidly obese. Vaccinations are available with your health care provider as well as at many local pharmacies. Practice good hygiene! Because you can pass a virus to someone before you know you are sick, it is important to keep your hands clean by washing them often with antibacterial soap or by using hand sanitizer. If you need to cough or sneeze, cough into your shoulder to avoid carrying the bacteria on our hands and transferring it to others. You may be contagious for 5-7 days after symptoms occur. Take your vitamins and get a good nights rest. Vitamin C is found in high concentrations in immune cells. When a patient begins to fall ill, these vitamins are quickly consumed. This important viatmin aids in healing. Did you know that your body needs Vitamin D to absorb Vitamin C effectively? So, before you dose up on C, be sure to have D available too! A good nights rest of 8 hours each night helps keep us healthy and at our best, ready to fight those nasty viruses.